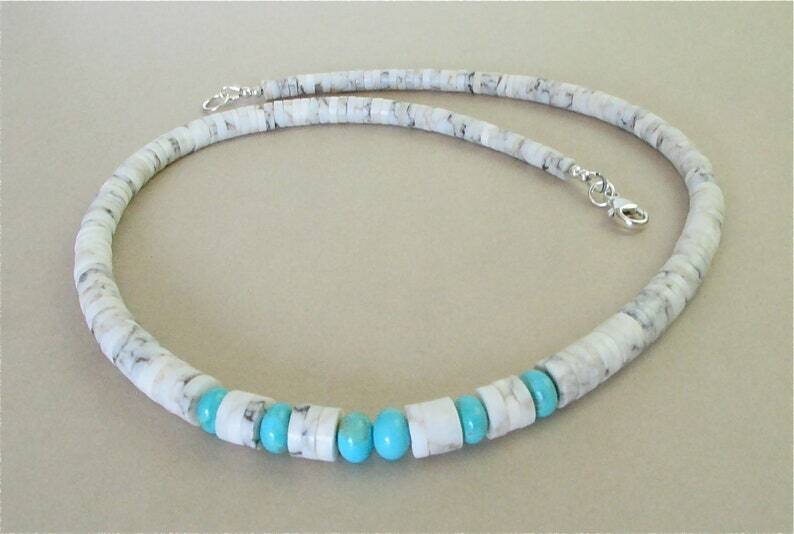 Gorgeous graduated strand of alabaster heishi with turquoise focal. The alabaster ranges in size from 5mm to 8mm, and comes from the Zia Pueblo area of New Mexico. The blue turquoise is 8mm rondell shape, and is from the Kingman mine here in Arizona. Be sure to look at the last photo where I have placed a dime next to the necklace so you can see the size of the beads. Finished off with a sturdy sterling silver lobster claw. This necklace is 20 inches long, including the clasp. Looks good layered with other necklaces, or by itself. Suitable for men and women!